Once a month Mo's Dream Team gets together and creates special projects based on a theme to give a little inspiration! This month the theme is Paper Piecing and Mina is our host this time around. So she is starting off the hop! I must admit I have never paper pieced...ever! But, I have to say now that I've done it, I really like it! I chose to use Tall Cake for my image from Mo's Digital Pencil. I paper pieced her dress using a Jilly Bean paper pad called Blossom Soup. I colored her with my usual Copics and shaded the dress paper, too. I used My Mind's Eye paper from the Love Me pad to decorate the card. I added some Wild Orchid flowers and stick pin for the sentiment, threw on some fabulous Frantage and this is what I got! Your last stop is Kaly and don't forget to leave comments along the way as there is a couple of spot prizes on comments left to be won!! Super cute card - your coloring is beautiful! i wish she comes to my party. Gorgeous and adorable, love all the details too. 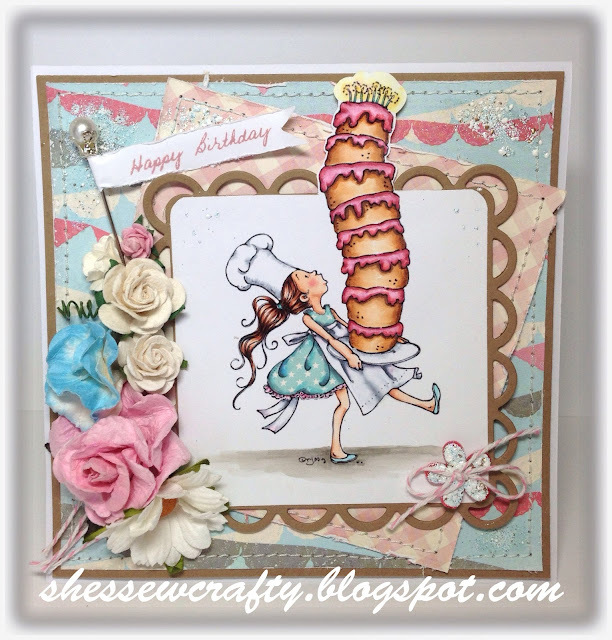 What a fun card (it is my birthday in October do you think she could make me a cake like this one!!!!). The flowers are beautiful and the background papers are great. The colouring of the main image is lovely. Another cutie here too, and I love when they´re a little fun too like this one, and the card looks wonderful. Well done hun. This is amazing! I love the image, your ocloring and the layout! Your card is very Beautiful! What a cake! WOW.. What a CAKE!!! Fantastic image.. Great Coloring and I love the colors used.. FAB color on her dress too.. Great layers and sewing of the papers.. FAB CARD §!!! Woohoo....this looks great!!! Fantastic card! Love it! This is one of my all time favorite Mo images and of course it's one I had to have when it was first released. I love the paper you used for her dress, and the card is so wonderully designed! So, so sweet! I want that cake! Lovely card! So adorable! Love the colors.your coloring is great. I so love this image! Your card is so beautiful! Love this dress, great paperpiecing. What a beautiful card with a funny digi. Nice with the paperpiercing. Fantastic card, Danielle! Love the papers and fun image! Great coloring, paper-piecing and card design! There's a first time for everything and you did great, love your card and paperpiecing!!! Wonderful! I love the sweet image...ha-ha and your paper piecing is gorgeous. Wonderful image and gorgeous card!! I love this image!! Love, love, love this card! This is absolutely wonderful, Danielle! The image is one of my favorites, and you've colored it beautifully! ADORABLE!!!" Love this image and your paper piecing. Great work. This is definetly another favorite! Now that is a birthday cake. This is so cute and beautifully done. Ha ha. I like this stamp. Fun design and fabulous coloring, Danielle! A wonderful paper pieced birthday card! This is so pretty. Love the image, love your layers & colors...just wonderful!!!! !